Perhaps you want to learn about the features of our various trading platforms and charting options. Maybe you are interested in the latest news and trading alerts from our research team. We value your feedback on our services, so please don’t hesitate to reach out to us. *FOREX.com refers to GAIN Capital Holdings Inc and its global regulated subsidiaries. Contracts for Difference (CFDs) are not available to US residents. Spot Gold and Silver are not subject to regulations under the US Commodity Exchange Act. Best place for Demo acct? Canadian looking for broker eh? Someone help with how the spread actually works? Could someone help me understand what happened to a demo trade? Does anyone know a broker with interest-free accounts and neat & clean platform? OK, I will bite. When are Ya’ll going to update your mobile trading platform, the charts are not big enough and the tools are very limited. At least the one I recently downloaded. We’ll follow up with our mobile app development team to get you the most accurate response, but first, please tell us your version number and whether you are on Android or iPhone. Our mobile app team is looking to release an update for Android within the next couple of months. While we can’t confirm the exact list of features that will be included in this update at this time, we can relay your feedback regarding the charts and tools on the app. Are there any particular tools you would like to see added? You mentioned the charts aren’t big enough. Have you already tried viewing them in landscape mode? Hey dude, the landscape looks good, but I think it would be nice to see it in portrait, where you could drag the chart to expand it over the markets overview, then drag it back down to continue to see the market overview. Also, more colors for levels and trend lines. We shared it with our mobile app team. Please stay tuned here for updates on when the next version is available for Android. Ok, so we figured out the order entry system, imho, a bit unwieldy, but functional. Next, on the mobile platform it would be nice to have entry, TP, and stop lines on the chart, they did not show up for me. 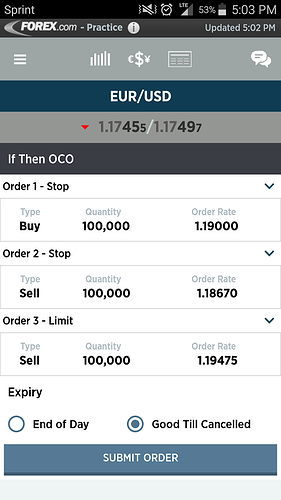 Oh and how about this, in landscape mode, you swipe down and you get you blotter with active trades, then you can tap one and either close it or adjust tp/stop. Also if you swipe up, you get the latest news. By the way how can I monetize these Brilliant Missives. And one more thing, while I am at it. I was experimenting with setting a bracket for this mornings news. I had it set on my live platform but, either I don’t know the your mobile platform well enough or well anyway. Here is what I mean, EUR/USD Set Long at 1.1900, STOP LOSS 33 pips, TP 47.5 pips. Then SHORT at 1.1862, STOP LOSS 19.5 pips, TP 30 pips. For the life of me I just could not find out how to do it. I think later on I will try it on the desktop platform and see if I can get that part of it, Oh yes, by the way I am green this morning. @TradeViper thanks for providing even more feedback we will share with our mobile app developers! 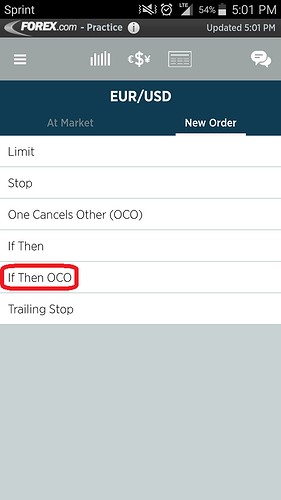 In regards to your question about setting up a bracket for news trading, you can create two separate “If Then OCO” orders – one to buy at 1.1900 and one to sell at 1.1862. 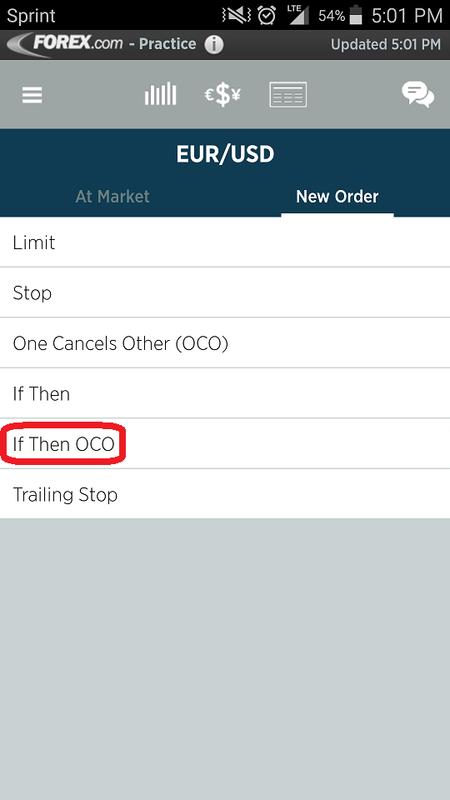 Below is an example of how to place the “If Then OCO” order to buy at 1.1900 with associated stop loss and take profit orders. Oh and here is another bugaboo, I put a horizontal line on a 1hr chart, then change to 15 min, the line moves away from the placement on the 1 Hr. No really it does. I’ve passed your comments along. FX, spot gold and silver will be closed on December 24th. Trading will resume at 22:00 GMT on December 25th. FX, spot gold and silver will be closed on December 31st. Trading will resume at 22:00 GMT on January 1st. holiday hours for Indices, Commodities and Equities. Forex Trading is available 24 hours a day from 22:00 GMT Sunday through 22:00 GMT on Friday, including most U.S. holidays. Please be advised of the potential for illiquid market conditions particularly at the open of the trading week. These conditions may result in wider spreads for some currency pairs based on market liquidity. Spot gold and silver trading is available 23 hours a day from 23:00 GMT Sunday through 22:00 GMT Friday. Trading is closed from 22:00 to 23:00 GMT daily. Spot gold and silver trading also follow CME holiday closures. Market hours and holidays are subject to change. We will keep this information up-to-date on a best efforts basis. Please be advised that on the holiday dates, there may be periods of limited liquidity in some markets. At FOREX.com, we’re committed to offering traders the markets they want to trade. We’re pleased to announce Bitcoin trading is now available with FOREX.com UK*. Bitcoin is one of the year’s most talked-about markets, starting 2017 priced under $1,000 and steadily rising to break several record highs, hitting $19,783.06 on Sunday, December 17th. The cryptocurrency’s high volatility has traders looking for potential short-term opportunities and you can now take advantage of them at FOREX.com. or Friday, December 22nd at 10:30 GMT. Bitcoin is a highly volatile market. The heightened volatility brings opportunity, but also a greater degree of risk. Make sure you fully understand the risk before you trade. *Spot Bitcoin Trading is not available in the US at this time, but US residents now have access to Bitcoin Futures Trading.